What Can You Use Tapping Therapy For? You can use tapping therapy to free yourself from these stored anxieties, stresses, depression, and emotional hurts, and focuses on helping you to better implement positivity and energy into your life. This can be done by tapping away any limiting beliefs, fears, and internal obstacles that arise when you face obstacles. When TFT tapping was first used in the 1970s, TFT tapping theory was based on the energy meridians of acupuncture. It was thought that clearing those energy meridians would clear a disruption in the body’s energy system, and so remove negative emotions. However, we have a new understanding based on recent scientific studies. It has been discovered that the brain does not become fixed by one’s early adult years, but rather, it can be changed at any age. New neural connections can always be formed. Unfortunately, this can work against us. When we experience trauma or something that triggers a negative emotion, we create neural pathways that support re-triggering that negative emotion. As an example, if you have an experience that causes you to believe that people are mean or dangerous, you will look for evidence to support this belief and ignore evidence to the contrary. We also create pathways that support limiting or disempowering beliefs that we may have created in the moment of trauma. Conditions like phobias and PTSD (post-traumatic stress syndrome) exist because the brain creates a feedback loop that builds and enhances neural pathways. Some fears are so strong that they can actually immobilize you. If you have a full-blown phobia, such as fear of flying or fear of being in an elevator, it can seriously inhibit your ability to be successful. Fortunately, there is a simple solution to most phobias by just doing tapping therapy. The process uses a simple but precise pattern of tapping on 9 acupressure points of the body while you simultaneously imagine the object or experience that stimulates your phobic reaction. It acts in much the same way as a virus in a computer program by permanently interrupting the “program” or sequence of events that occur in the brain between the initial sighting of the thing you are afraid of and the physical response you experience. Many past hurts get stored in the mind and even in the body—affecting all our future actions and decisions. For many people in my training, getting past their “past” is difficult, painful, and—until the last decade or so—very difficult, particularly if they have experienced violence, trauma, or abuse early in life. The technique is so powerful that it has been used with genocide victims in Rwanda and Bosnia, for disaster victims in Hait and is used by a trainer of the British Special Forces in the Congo and with U.S. soldiers returning with PTSD panic attacks from the battlefield. Tapping Therapy stimulates the body’s own ability to release stored pain of any kind. The results are nothing short of miraculous. For thousands of years, Eastern cultures have focused their methods for healing medical conditions on stimulating energy “meridians” or pathways throughout the body. These energy pathways send electrical impulses throughout the body to keep all systems working, but—in addition to moving and storing energy—it was discovered they also store emotions. Some healthcare professionals even believe that an illness or chronic pain in a specific area of the body is the result of a specific emotional pain stored in that meridian. There are the eight main tapping points and one point on your hand known as the karate chop spot on the heel of your hand. 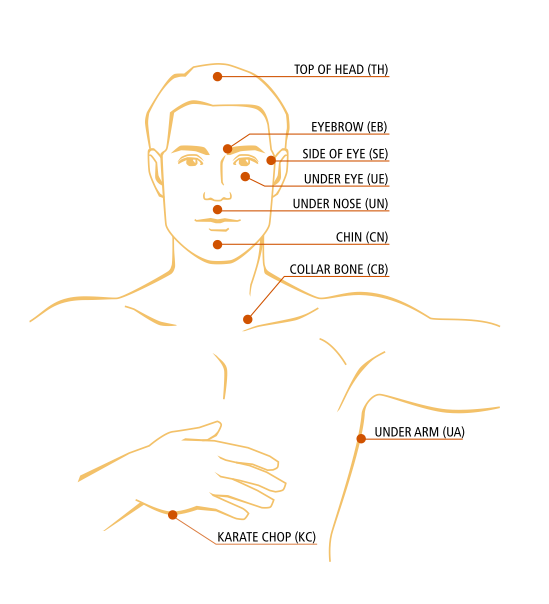 The other 8 points are, your eyebrow, side of your eye, under your eye, under your nose, your chin, your collarbone, under your arm, and the top of your head. There is a single point at the top of the head, but there are two eyebrow points: one at the start of the right eyebrow just above the nose, and the other at the start of the left eyebrow. Tapping was originally taught one-sided; you tap with either hand, on either side of the body. Most people tap with their dominant hand. You have completed a “round” of tapping when you’ve tapped on each of the points. Tap lightly, but firmly. This isn’t massage, so tapping with force isn’t necessary. If you can’t tap a particular point due to an injury, just skip that point. Unlike acupuncture, tapping is a very forgiving process. One reason it is common to tap using both the index finger and the middle finger together is that you’re tapping a fairly large area with both fingers on any particular spot. The first part of the tapping protocol is to close your eyes, focus on the fear, anxiety, emotion, pain, or belief that you wish to release, and then determine on a scale of 1 to 10, 10 being high, how intense the feeling or belief is. The basic tapping sequence—to eliminate fears and negative beliefs and to neutralize negative events— then starts by tapping the “karate chop” spot on the heel of your hand 10 times, firmly enough to feel it, but not hard enough to bruise your hand. As you tap your hand, repeat aloud the belief, physical pain, or experience of hurt you are dealing with as you—most important—tune in to the emotion that belief or hurt brings forth. Do this three times. Once you’ve tapped the “karate chop” spot while you repeat that phrase 3 times, begin the tapping sequence below while continuing to focus on the past hurt, limiting belief, emotion, stress, pain, or source of anxiety. Tap 5 to 7 times firmly at each point. Accompany each tapping point with a statement that keeps you focused on the emotion. The exact words you say aren’t important; what’s important is that you are continually tuned in to your emotion. Additionally, you can tap the eyebrow, under the eye, collarbone, and under the arm spots on either side of your body. Repeat the sequence repeating your phrase again and again until you feel the intensity has dropped down to a 1 or is totally gone. If you’re interested in learning more about Tapping Therapy and success, my friends at The Tapping Solution have a great free guide called: 103 Disempowering Beliefs About Money and Success and How to Eliminate Them In Minutes. 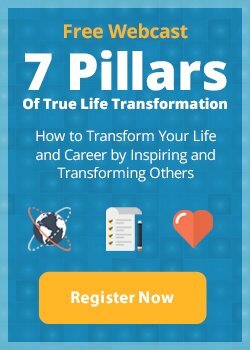 You’ll be given Step-by-Step instructions on how to use the scientifically proven Tapping Technique to eliminate any negative beliefs you have and install positive ones! Leave a comment below and let me know if you have you ever tried Tapping Therapy. How did you feel after you did it? To learn more about tapping, get this free guide.